This page offers information on the history of the Cuneiform Commentaries Project, its staff, and the scholars and institutions it cooperates with. The origins of the Cuneiform Commentaries Project (CCP) go back to E. Frahm’s 2011E. Frahm, Babylonian and Assyrian Text Commentaries. Origins of Interpretation. Ugarit-Verlag, 2011. study on Mesopotamian commentaries. Even though it included numerous quotations of individual commentary entries, Frahm’s study was not aimed at publishing in full large numbers of commentaries. Its goal was rather to provide a comprehensive catalog of every known commentary tablet. The book made it abundantly clear that there was a need for a comprehensive edition of all known commentary tablets: of the 878 known tablets and fragments, only 396 were edited, and still only a handful of those in modern, reliable editions. In contrast 482 commentary tablets (55% of the total) remain either unedited or entirely unpublished. Frahm’s monograph thus constitutes the basis for the ultimate goal of editing all the commentaries, including those that have never been properly studied before. In the fall of 2013, Frahm received research funds from Yale University that allowed him to make a significant step forward in this direction. He was able to hire Dr. Enrique Jiménez as a Postdoctoral Associate and to start working with him on what was soon dubbed the Cuneiform Commentaries Project. The first stage of the project, now finished, entailed the creation of a searchable electronic database for the corpus and its publication online. The final version of the database includes 40 different fields and allows searches based on many different criteria. Work on the catalog began in September 2013 and came to an end in August 2014. The bibliographical component of the catalog aims at being exhaustive, and in some cases up to thirty-five references are given (as in CCP 4.2.M.a). The catalog is now available in its entirety on the website, under http://ccp.yale.edu/catalog. It continues to be updated on a regular basis. The second goal of the project is to offer photographs of as many commentary tablets as possible, especially the unpublished tablets from the British Museum and those for which no photograph is available at the Cuneiform Digital Library Initiative (CDLI) or at the British Museum's online catalog. Currently the photographic archive of the CCP consists of more than 5,000 photographs of almost 200 tablets, which represents some 20% of all commentary tablets known. The photos will constitute a key resource for all future study on Mesopotamian commentaries. The third goal of the Cuneiform Commentaries Project is to produce a significant number of full editions of Babylonian and Assyrian commentaries. In this respect the project makes full use of the splendid set of tools created by Steve Tinney for the Open Richly Annotated Cuneiform Corpus (Oracc), and is fortunate enough to count on the generous help of Niek Veldhuis. Editions are being regularly uploaded to the project’s Oracc subproject, the Cuneiform Commentaries Project on Oracc (CCPo), from where they are embedded directly in the project’s website. The project's website has been developed by Dr. Enrique Jiménez using the YaleSites/Drupal platform, maintained by Yale ITS. The Cuneiform Commentaries Project started uploading contents in the fall of 2013, and will be funded until the fall of 2016. Efforts are being made to ensure funding for the project at least until 2018. Several scholars have contributed to the Cuneiform Commentaries Project database. Many of them generously communicated their identifications of commentary tablets to the CCP staff. Most importantly Dr. Christopher B. F. Walker (London), who most kindly supplied a list of several hundred fragments in the British Museum's "Babylon Collection" suspected to contain commentaries. Dr. habil. Jeanette C. Fincke (Leiden) has graciously shared her identifications of many tablets and fragments. Other scholars who have shared their knowledge of commentaries include Dr. habil. Barbara Böck (Madrid), Dr. Uri Gabbay (Jerusalem), and Dr. habil. Nils P. Heeßel (Würzburg). Most of the project's photographs have been taken by Dr. Enrique Jiménez in the course of three research trips to the British Museum (January and August 2014 and January 2015). Other scholars have kindly provided the project with photographs and consented for them to be displayed online. They include Dr. habil. Jeanette C. Fincke (Leiden), Mary Frazer (New Haven), Dr. Uri Gabbay (Jerusalem), Prof. Dr. Daniel Schwemer (Würzburg), and Zack Wainer (Providence). The following scholars have kindly consented for their copies to be shown in the CCP website: Dr. habil. Barbara Böck (Madrid), Dr. Irving L. Finkel (London), Dr. Sally M. Freedman (Princeton), Prof. Andrew R. George (London), Dr. habil. Nils P. Heeßel (Würzburg), ao. Prof. Dr. phil. Hermann Hunger (Vienna), Dr. Ulla Koch (Copenhagen), Prof. Dr. Daniel Schwemer (Würzburg), and Dr. Lorenzo Verderame (Rome). Ashmolean Museum, University of Oxford. Thanks are expressed to Dr. Paul Collins, Curator for Ancient Near East (Ashmolean Museum). The British Museum, London. Thanks are expressed to Dr. Irving Finkel, Assistant Keeper (Department of the Middle East); Jonathan Taylor, Assistant Keeper (Department of the Middle East); and Jonathan N. Tubb, Keeper (Department of the Middle East). Photographs of tablets kept in the British Museum are published online with the kind permission of the Trustees of the British Museum. Brooklyn Museum, New York. Thanks are expressed to Kathy Zurek-Doule, Curatorial Assistant for Egyptian Classical and Ancient Near Eastern Art. Free Library of Philadelphia, Philadelphia. Thanks are expressed to Joseph Eytan Shemtov, Librarian (Rare Book Department). Oriental Institute, University of Chicago. Thanks are expressed to Prof. Walter Farber, Curator. Royal Ontario Museum, Toronto. Thanks are expressed to Dr. Clemens Reichel, Associate Curator; and to Bill Pratt, Collection Technician (Egypt and West Asia). University of Pennsylvania Museum of Archaeology and Anthropology. Thanks are expressed to Prof. Stephen J. Tinney, Deputy Director and Chief Curator. Vorderasiatisches Museum, Berlin. Thanks are expressed to Prof. Dr. Markus Hilgert, Director. Yale Babylonian Collection, Yale University. Thanks are expressed to Prof. Benjamin R. Foster, Curator. Twenty one museums and collections in the world are known to host commentary tablets. The British Museum is by far the most important of them: in fact more than half of the corpus of cuneiform commentaries (a total of 463 tablets and fragments) stems from the libraries of Ashurbanipal in Nineveh, which are now kept almost entirely in the British Museum. Other important collections of commentary tablets include the National Museum of Iraq (Baghdad), the Vorderasiatisches Museum (Berlin), the Yale Babylonian Collection (New Haven), and the Louvre Museum (Paris). 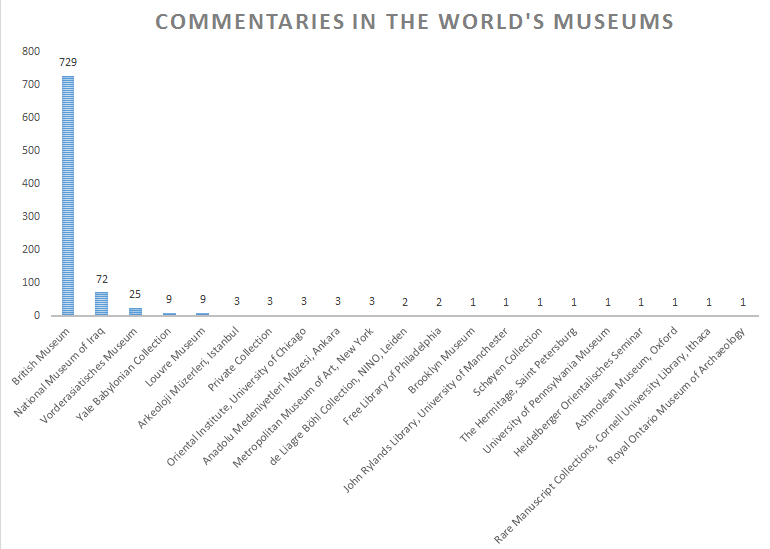 The graph below illustrates the distribution of commentary tablets in the world's museums.